BGLL: Thanks so much Myrna for agreeing to share your story and tips for those who wish to teach English abroad. Myrna: Thank you for asking to feature me. I'm so honored! BGLL: So, tell us more about yourself. What languages do you currently speak? Myrna: My name is Myrna Joseph and I am from NYC. I am Haitian and Dominican. I speak English and understand Haitian-Creole. I have a BA in the Arts from Queens College. Currently working as an ESL teacher in China but hoping to go to other countries. BGLL: Do you know any other languages? Myrna: I learned Spanish in school. Started early because I was in advanced classes and finished 6 years of studies by the 11th grade. I was very good with reading and writing but horrible at speaking. Sadly, I lost it [Spanish] due to not practicing, but I want to relearn and possibly move to a Spanish speaking country to force myself to use it more. I’m also currently learning Chinese, since I’m in China. BGLL: Tell me more about that. When did you decide wanted to teach English as a foreign language abroad? Myrna: Sometime around college. I was doing volunteer work with an organization created by the Bloomberg administration called "We Are New York", teaching immigrants conversational English. During that time, I got the taste of teaching and decided I really wouldn't mind traveling and doing this. BGLL: Do you feel teaching English has helped you understand language concepts better in general? Did you have a good understanding of English before you started (i.e. subject, predicate, prepositional phrases, adjectives, etc.)? Myrna: My grammar has improved working here. It's crazy, that teaching helped me learn grammar terminology. I know how to do it but it's a whole new world trying to explain it to someone else and explaining why it is important. I know understand the importance of a classroom setting for learning language. BGLL: Do you have a TEFL/TESOL certificate to supplement your degree? Myrna: I don't. Luckily, I came to China before that was a requirement. I would recommend getting one to anyone who wants to teach in China. BGLL: How was teaching English for the first time? Do you feel your certificate or education properly prepared you? Myrna: It was nerve wracking for sure. My students ages ranged from being a few years younger than me to being older than me, but little did I know that would give me an advantage. I could connect with them better and they were more willing to open up to me. Luckily, they gave me respect because I was their teacher despite my age. To anyone doing this for the first time, I suggest teaching at the university level. BGLL: How long have you been teaching English? How long in China? Myrna: Total years include volunteer work has been almost 5 years. I have been in China for a few months over 3 years now. BGLL: How was the visa process? Myrna: The process wasn't easy. The first time I had to apply under a F visa (volunteer), work a bit and then travel to Hong Kong to get a Z (working) visa. Recently, the visa qualifications have changed. More to the advantage of those with experience. The second time around I had to go back to America but I could get my Z visa directly in the states. No more traveling to China first to get a working visa. It was overall expensive and long but worth it. 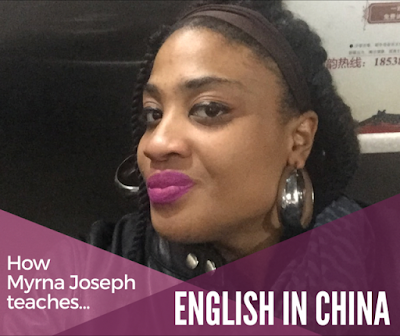 BGLL: What is it like living in China as a black woman in a homogeneous society? Myrna: It's a trip honestly. With the locals who are worldlier, it's fine. They won't stare or ask ignorant questions. They can tell the difference between movie black people and real black people. But the ignorant locals, it can be frustrating. They stare, take pictures without your permission (which they share on the social media and say racist stuff, of course), or try to touch you and your hair. Protective styles are a new concept for them. Some of my students believe that my hair just grows overnight (it doesn't help that I tell them that, too). Eventually, the students get used to it and get excited to see what new hairstyle you will have. I don't teach younger students, so I don't have to worry about parents complaining about my hair, but others [black ESL teachers] have experienced that. My advice, prepare to get angry a lot but also understand you must check your anger. Still, be firm! Tell them no with authority in your voice and they will leave you alone. Speaking and understanding the language help (if you call them out on what they do, they get embarrassed and apologize). I honestly think I have an easier time than a black man would. I may be black but I am still a woman. Which means I get less hate. And better job opportunities. BGLL: How do your students treat you? The faculty? Your boss? Myrna: My first job was with a foreign company (Canadian based called EIE, Education in English). I didn't have to deal with Chinese co-workers, just my boss and his employees. They were pretty good (in comparison to other companies I have worked for), except when it came with wages. They were cheap!! They refused to pay more, even though they were making money for each foreign teacher they provided to universities. The students were amazing, however. They were so eager to learn English. I loved every minute teaching them. The next company, Tengda, was the worst so far. They were better with wages but they provided no support at all. I came to find out the reason why they paid well, is because they charged you for every little thing. The apartment and utilities, I had to pay out of pocket. I paid more for it with them than I would have on my own. I had to leave them after 6 months because of how they conducted business. I had to teach middle school and high school. Worst experience teaching ever. The students were a bit wealthier and behaved with entitlement and complete lack of respect for foreigners. Not all were horrible, but enough that I was more than happy to leave. Currently, I don't have a company. I work directly with a university. They provide me with a nice salary, free accommodations and even pay for my meals and traveling. But if you want to get paid really well, then work with kids. My co-workers are Chinese this time around, and some do not speak English at all. I think this will be the push I need to learn the language. My students are great, I'm their first foreign teacher. Their English level is lower than I have ever had but they want to learn, which is always a plus. BGLL: If you could give one piece of advice to a young woman who wants to teach English in China what would it be? Myrna: ​LEARN THE LANGUAGE! The doors that will open for you when you do! Learn about the culture too. Understand that the Chinese are currently at a crossroad. Many are interested in western culture but they also fear losing their own identity and culture. For black women, know that anti-blackness is worldwide. This is a homogenous society. Yes, there are different ethnic groups but they are all essentially Chinese. They treat their own people with darker skin poorly, so be prepared to get the same treatment. Be patient and be prepared for things to be changed at the last minute. The whole planning ahead thing doesn't exist here. Classes get cancelled or added to your schedule last minute. They have a hierarchy in the schools and you are last on their list, so you must be flexible. If you want to study English, I recommend you do it online - it is the most comfortable and quick way to do it! Check out this website - homework lab It's so good in doing your homework properly, I've been using it myself! You'll get help from a team of professionals and also be able to get better in writing essays. Doing your homework good was never so easy before.